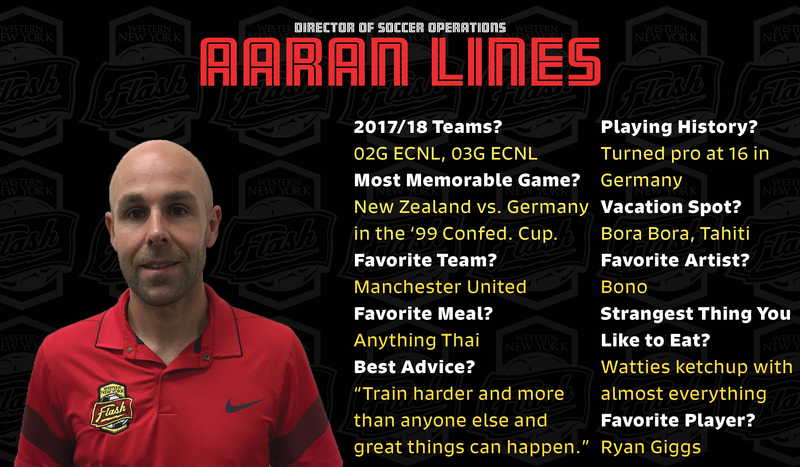 In January 2016, Aaran Lines was named Vice President of the WNY Flash after seven years as the team's head coach. Lines has been a paramount figure in the success of the WNY Flash organization. In 2009, he was hired as the USL W-League Buffalo Flash's head coach where he led the squad to an impressive 10-3-3 record and a trip to the second round of the playoffs. In only his second year of the league, he led the squad to an undefeated season and a W-League Championship. The WNY Flash joined Women’s Professional Soccer(WPS) in 2010 where Lines was hired as Head Coach. The New Zealand native lead the club to its decisive WPS Championship in 2011 with a star studded roster that included Marta-Brazil, Alex Morgan-USA, Caroline Seger-Sweden and Christine Sinclair-Canada. In 2010 he also paved the way for club to enter the WPS with a W-League Championship in an undefeated season. Western New York Flash capped their inaugural season in WPS by capturing the 2011 WPS Championship title 1-1 (5-4) in a penalty kick shootout in front of the largest championship crowd in league history. Lines led players Whitney Engen (Defender of the Year) and Ashlyn Harris (Goalkeeper of the Year) to their first ever WPS year end awards. Four players made their debut in WPS under Lines (Brandao, Davison, Morgan and Sahlen) and the squad was the highest goal scoring team in the league and in WPS history with 43 goals. Marta recieved the Golden Boot award for the 2011 season. The WNY Flash went on to win their 3rd consecutive Championship in the WPSL Elite League(2012). In 2013, the Flash were selected as one of eight teams for the inaugural season of the National Women's Soccer League. In the new pro league's first year, Lines took the Flash to yet another title game. After winning the 2013 Regular Season title, the Flash were able to contend for their fourth-straight title and host the NWSL Championship game at Sahlen's Stadium. The Flash claimed the top of the table on the final day of the regular season, the first time the club held the No. 1 ranking all year. The team would finish as runner-up to Portland Thorns FC, falling 2-0 in the Championship game. Participated in the 1999 and 2003 FIFA Confederations cup with the NZ National Team and has played full competitive international games against 5-time world champion Brazil, as well as Germany, France, and the USA.